Yesterday the Daily Mail ran a report on our recent jaunt from London to Edinburgh. To be fair to one of my least favourite British rags, it was a fairly balanced report of the journey. The comments underneath (429 when I took the screen grab) are jaw droppingly predictable. David Peilow, my co-driver on the trip is not only far more sceintifically qualified, he's also braver than me and went onto the Daily Mail site to post a comment to at least partially balance the rabid, blinkered and ignorant comments which run off into the night like overflowing sewage. However the site managed to crash three browsers on two of his computers, so he sent the comment to me and I thought it was very succinct and clear. I see there are quite a few comments that are a bit wide of the mark, so I'll bring some experience to the discussion. - Yes the LEAF and other electric cars run on coal. They also run on wind, solar, gas and uranium. The great thing is that they can run on whatever makes electricity. No one supplier can hold us to ransom. If you work it out for the UK grid, the LEAF produces 56.2 g/km. Not bad for a mid-sized hatchback. - Our drive to Edinburgh used 121 kWh. Just to refine the petrol for my old car would have taken 122 kWh. They don't include that on the label attached to cars in the showroom. - If we had to pay for the electricity to fill up at commercial rates, it would be £1.38. - I did this drive many times in a petrol car. It takes 7.5 hours plus stoppage time. The stops for lunch and coffee would add at least another hour. I'm happy to take a couple of hours longer for zero cost. I thought it might get tedious, but it didn't. If I'm in a rush I'll take the train. - Nissan provided the chargers for the Ecotricity network and Ecotricity provide the electricity. Their wind turbines make so much that they can spare to give away the small amount needed to charge cars. Most of us drivers switched to them as suppliers anyway, so it's just good marketing. - Once sites get popular, Ecotricity will install more chargers. In America, some places have 12 chargers already. 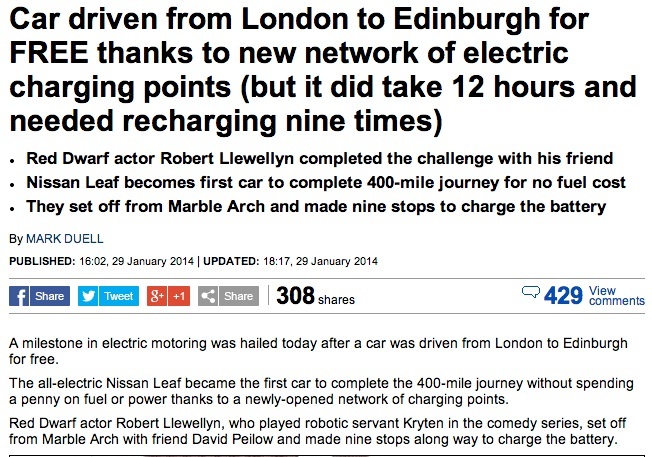 - The car in Newcastle with 50,000 miles on the clock HAS ONLY EVER BEEN RAPID CHARGED. Its batteries are completely healthy. There are cars in America built in the 1990s that are still working fine. - Most people charge up overnight or at work. 90% of all charging happens this way. You start the day with a full 'tank' and most days never need to visit a service station. My Vauxhall Ampera hybrid goes months without a fill-up and gets 250 mpg. - The UK grid has enough capacity to charge all 29 million cars overnight for 10,000 miles a year each. - The LEAF starts at £15,990 but there are several second hand and ex-demo ones around for less. At my work we have a 24 year old graduate who leases one because the cost is less than old car's petrol bill. - I presume that people so against EVs will be the last ones happy to pay £100 to fill their tanks. Or were happy for the West to send $2 BILLION A DAY (today's rates) to the Middle East for the last 40 years.